Dr. Enryo Inoue, the founder of Toyo University, wrote, “Progress is not to regress,” which implies that “you should make efforts to learn and study to contribute to people and society, rather than just for your own sake.” This idea has been handed down as “improving oneself for the benefit of others” in the University’s founding spirit. Volunteer activities based on free will also lead to putting into practice the principle that the University has cherished since its founding. Serving as volunteers and playing an important role in hosting the Games will provide young people, who will soon launch into society as full-fledged adults, with the ideal opportunity to feel the joy of living as an indispensable member of society by contributing to others, and to learn many lessons helpful to their own self-development. A questionnaire to which Toyo University students responded in 2016 showed that many respondents were highly interested in being involved in the Games not only “As a spectator and supporter at Games venues,” but also “Through interactions with international visitors,” or “As a Games volunteer.” In response to these needs, the University offers volunteer training and programs to current students, hoping that many students will serve as volunteers in the Tokyo 2020 Games. Sports volunteers offer various services, including cooperation with sports clubs or organizations, support for parasports, and assistance in event operations, and now play an important role in supporting the sporting field. 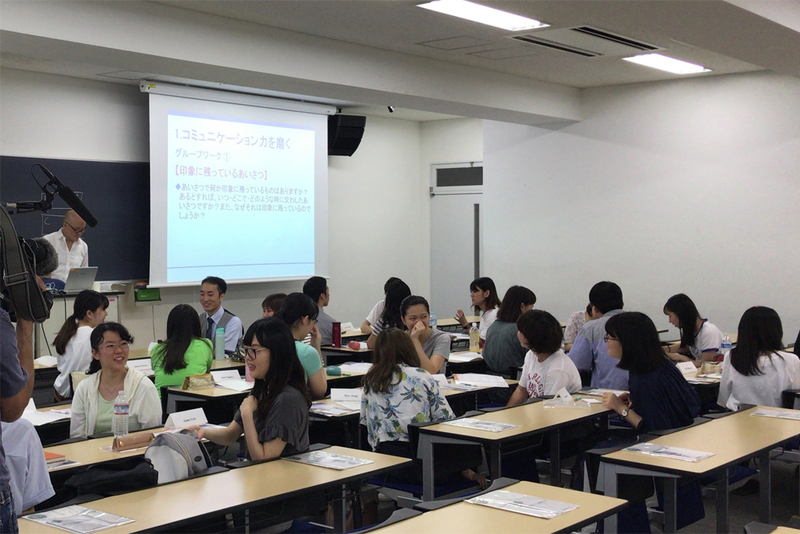 In May 2018, Toyo University offered four-part Sports Volunteer Training to allow students to acquire the basic knowledge necessary for sports volunteers. The attendees began by learning how to serve as icebreakers, who help people new to each other relax and communicate comfortably, and then listened to lectures on an outline of sports volunteer activities and parasports. In group work, they strove to acquire from hands-on experience the ability to recognize and understand others. Finally, the attendees closely examined the realities of sports volunteers using various statistical data. Instructors explained that sports volunteer activities are a kind of “support as sports,” and that needs for sports volunteers would further grow especially in support for parasports from now on. It is desirable that this training will motivate many students to become active sports volunteers and play an important role in the Tokyo 2020 Games. During the Tokyo 2020 Games, many international tourists will visit Tokyo. Gaikokujin Omotenashi Gogaku Volunteers (Language-service Volunteers who Show Warm Hospitality to International Visitors) are volunteers who talk in plain English to international visitors who have some problems on the streets and help them. They will work as volunteers in their everyday lives without time and space limitations. This program, offered in May 2018, aimed to motivate students to talk to and help international visitors with courage showing their spirit of omotenashi (hospitality) even if they are not confident about their English proficiency. In this program, the attendees viewed a reference video, and learned practical skills in giving directions and traffic information, and responding to emergencies, as well as preparedness to offer warm hospitality in an impressive way, while participating in a gesture game, a role play, pair work, and group work. If people in Japan can appropriately express their considerate attitudes and readiness to help others in trouble, it will help share the charms of Japan with many more people from abroad. As grass-roots power, our hospitality will allow international tourists to feel the joy of attending the Olympic and Paralympic Games and take happy memories of Japan back home, leading to success of the Games. This program aimed to provide students with the opportunity to listen to lectures given by instructors invited from Bournemouth University, whose students played an outstanding role as volunteers in the London 2012 Games, and enhance their knowledge about volunteer activities. The attendees proposed their ideas from various perspectives, including cooperation between students beyond campus borders, and collaboration with local communities using the University Festival and other occasions. The program served as a valuable place for learning and opinion exchange, allowing students to explore new possibilities in volunteer activities.